The tables below display the mintage figures for American Platinum Eagle coins. This includes mintages for the regular bullion, collectible proof, and collectible uncirculated versions of the coin across all denominations. Unless otherwise noted, all figures represent the final audited mintage data provided by the United States Mint. In the case of collector coins, the mintages listed included the number of coins sold individually as well as the number of coins sold as part of multi-coin sets. 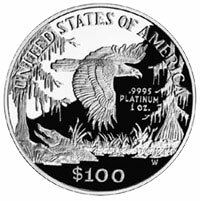 The American Platinum Eagle bullion coins were not issued during the years 2009 to 2013 and 2015. The collectible uncirculated versions of the coin were issued only from 2006 to 2008. The standard proof versions have been issued in one ounce size only since 2009. The lowest mintage coin across all options is the 2008-W 1/2 oz collectible uncirculated coin at only 2,253 pieces. The highest mintage was seen for the 1998 1 oz bullion coin.